"We would like to thank Luke for his dedicated service over the last three years," Lakers general manager Rob Pelinka said in the statement. "We wish Luke and his family the best of luck moving forward." "I want to thank Jeanie Buss and the Buss family for giving me the opportunity to coach the Lakers," added Walton. "This franchise and the city will always be special to me and my family." Walton inherited a team that was ripped to the studs by Kobe Bryant's retirement tour and propped up by a pair of the NBA's worst contracts — Luol Deng and Timofey Mozgov, one of whom is still cashing checks not to play for the Lakers and the other of whom cost them their No. 2 pick from 2015 in a salary dump. Starless and cap-strapped is not the best starting point, but Walton built the crop of draft picks who followed into a team attractive enough to lure LeBron to Los Angeles. LeBron's arrival, along with the hirings of Magic Johnson and Rob Pelinka to run the front office, came with playoff — and title — expectations. This, despite the fact that Johnson and Pelinka put their team-building effort on hold until 2019 by signing a cast of characters to one-year deals. There was every reason to believe the piecemeal Lakers would start slow and struggle to challenge the Western Conference elite at the jump, so naturally Johnson admonished Walton for both his offensive and defensive schemes in a meeting eight games into the season. All that said, Walton's Lakers were in fourth place, two losses out of the No. 2 seed, when LeBron suffered a groin injury on Christmas that cost him three weeks and lingered until he was shut down for good. Season-ending injuries to Lonzo Ball and Brandon Ingramalso followed. The Lakers predictably fell out of the playoff picture. The team also engaged in trade talks with the New Orleans Pelicans to acquire Anthony Davis that included half the roster and ultimately failed. Even the Lakers concede this created a chemistry problem that contributed to the team’s tailspin. None of this was Walton's fault. You can only accomplish so much when your front office hands you a star, demolishes the locker room, and that star strains his groin. Earlier reports suggested Lakers owner Jeanie Buss would resist efforts to put Walton on the chopping block, but she recently softened on that stance, and the front office apparently convinced the powers that be that the coach was culpable for the slip in the standings, not LeBron's injury or an oddly constructed roster. It seemed only a matter of time that Walton would get the axe, particularly after Johnson informed us during his bizarre resignation press conference that Buss had granted him permission to fire Walton — and that he was afraid to do it himself. Now, the Lakers must find a coach who balances the weight of Lakers and LeBron exceptionalism with the player development of Ingram, Ball, Kyle Kuzma and Josh Hart. Candidates range from the forgotten to the familiar, with a host of unproven prospects in between. 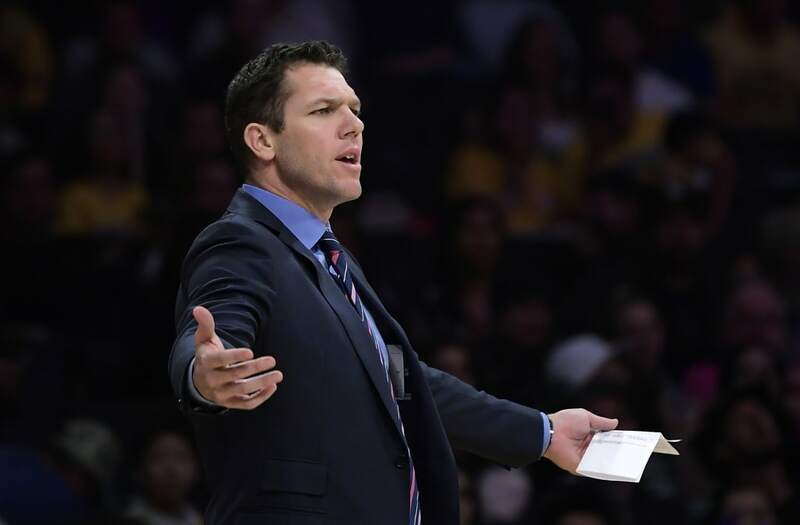 There is no guarantee that the next coach will be better than Walton, and there is no evidence to suggest Pelinka can find one who is. The hope for the Lakers is that whoever is hired to replace Johnson is capable of finding the right fit. The one sure bet is that the Lakers will consider every coach whose name would look good on an L.A. marquee. Don't be surprised if Phil Jackson is involved. From Mike Brown to Erik Spoelstra to David Blatt and Tyronn Lue, LeBron has clashed with every coach he has ever had, save for Walton — as far as we know. Understanding the learning curve, LeBron previously pledged support for Walton following Johnson's admonishment. The next coach will surely have LeBron's endorsement upon his or her hiring, but there are no assurances beyond that. Meanwhile, Walton's name will appear in every other coaching search around the NBA. The 39-year-old’s résumé includes a 39-4 start as interim coach of the Golden State Warriors during their 73-win 2015-16 campaign. There have been offensive struggles in L.A., for sure, but the Lakers' dearth of 3-point shooters in an era when that shot has taken hold did not do Walton any favors. The Lakers' defense under Walton improved from dead last in Year 1 to 13th in Year 2 and top-10 this season before the late-season landslide. That is the sort of year-over-year growth most rebuilding teams would like to see from a young roster. It is not what the Lakers wanted from Walton once LeBron signed. That they expected anything more from a team that lost its best player for a good chunk of the season makes you wonder if Johnson and Pelinka were looking for any excuse to fire Walton and bring in their guy. But the front office only gets one chance to axe an incumbent coach, and next time any shortfall of expectations will be on them.